5-566 PROGRAM TRACKING AND REPORTING SUBSYSTEM (PTRS) ACTIVITY CODE. 1528 (as appropriate, for renewal, reinstatement, added rating, or upon application). 5-567 OBJECTIVE. This task determines if an applicant is eligible for a Gold Seal Flight Instructor Certificate. Successful completion of this task results in the issuance of a Temporary Airman Certificate for a gold seal flight instructor or the denial of a Gold Seal Flight Instructor Certificate. A. Purpose of a Gold Seal Flight Instructor Certificate. Flight Instructor Certificates with distinctive gold seals are issued to instructors who currently meet certain qualifications. These certificates are intended to identify those instructors who have high personal qualifications and good records as active flight instructors. The Federal Aviation Administration (FAA) hopes to issue as many gold seal certificates as possible to provide an incentive for flight instructors to improve their qualifications. B. Renewal and Eligibility. The holder of a Gold Seal Flight Instructor Certificate who applies for renewal does not need to reestablish his or her eligibility for a gold seal. C. Issuance. If the applicant meets the criteria stated in subparagraph 5-571E, the aviation safety inspector (ASI) may add a gold seal to the instructor’s certificate upon renewal or reinstatement, when adding an additional rating, or upon initial application. 5-569 PREREQUISITES AND COORDINATION REQUIREMENTS. • Qualification as an ASI (Operations) or aviation safety technician (AST). • Accident Incident Data System (AIDS). 5-570 REFERENCES, FORMS, AND JOB AIDS. • Advisory Circular (AC) 61-65, Certification: Pilots and Flight and Ground Instructors. 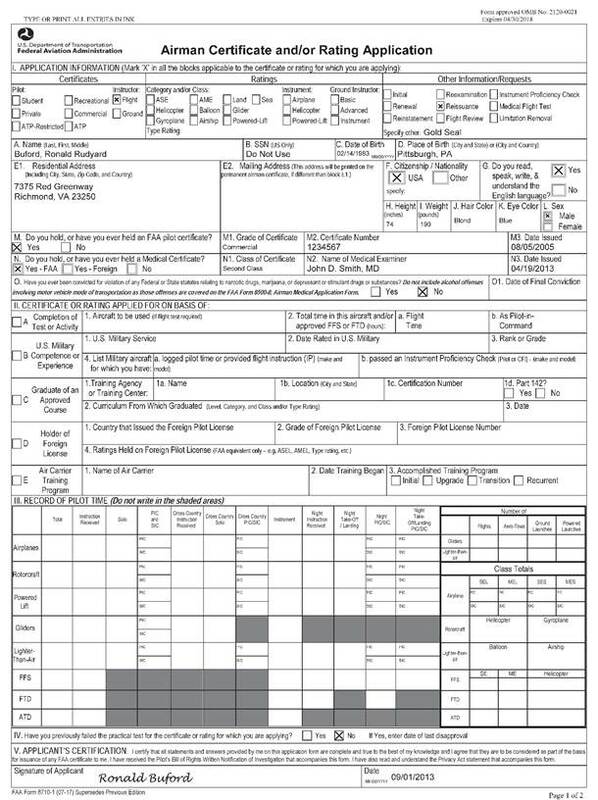 • FAA Form 8060-4, Temporary Airman Certificate (Figure 5-61). 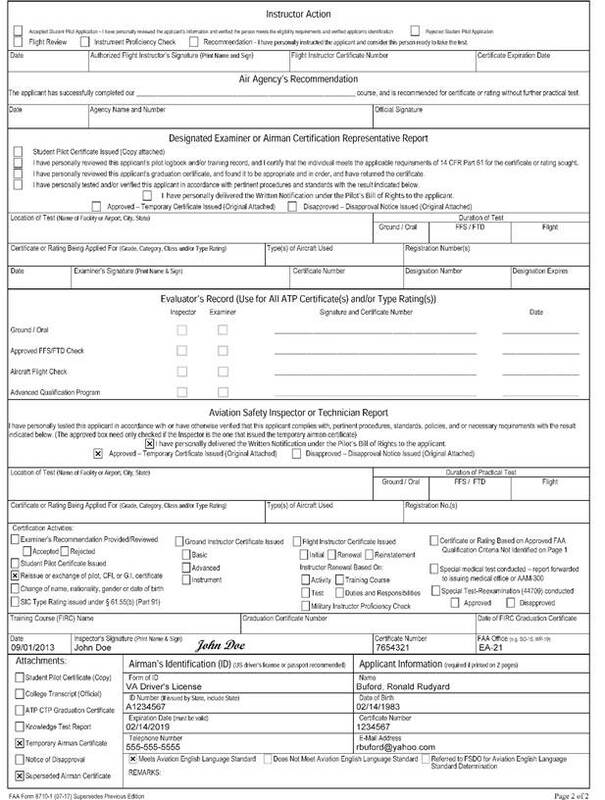 • FAA Form 8710-1, Airman Certificate and/or Rating Application (Figure 5-60). C. Job Aids. Job Task Analysis (JTA) O3.1.54, Issue a Gold Seal Flight Instructor Certificate. • A reliable record of flight instruction. B. The Applicant Arrives for the Appointment. 1) Collect the documents listed above. 2) Open the PTRS Record. C. Review FAA Form 8710-1. 2) Check the application for accuracy, using the instructions on the form attachment. The applicant is not to complete section II. 3) In section III, Record of Pilot Time, the applicant must list at least the aeronautical experience required for the Airman Certificate and rating sought. Graduates of 14 CFR part 141 pilot schools or 14 CFR part 142 training centers must provide their aeronautical experience in this section of FAA Form 8710-1, even though the graduation certificate is evidence of having completed the course of training. If aeronautical experience has no bearing on the airman certification action being sought, then it is not necessary for an applicant to complete section III. For example, with flight instructor renewal applications, flight instructor reinstatement applications, ground instructor qualification applications, pilot type rating applications, and utilization of a Bilateral Aviation Safety Agreement (BASA), aeronautical experience does not have a bearing on the airman certification action, and thus the applicant would not be required to complete section III. However, all applicants are encouraged to complete section III, because the application remains on file with the FAA and can be used to substantiate past aeronautical experience if a person were to ever lose his or her logbook. D. Verify the Applicant’s Identity. Inspect acceptable forms of identification to verify the applicant’s identity (see Volume 5, Chapter 1, Section 3). Compare the identification with the personal information provided on FAA Form 8710-1. 1) If the ASI or AST can verify the applicant’s identity, continue the issuing process. 2) If the ASI or AST cannot verify the applicant’s identity because of a lack of or inadequate identification, explain what types of identification are acceptable. Advise the applicant to return with appropriate identification to reapply. • A combination of the above two (two practical tests equal one trained and recommended applicant). F. Discrepancies. If a discrepancy that cannot be immediately corrected exists in any of the documents, return the application and all submitted documents to the applicant. Inform the applicant why he or she is ineligible and explain how the applicant may correct the discrepancies. G. The Applicant Meets Requirements. If an applicant meets all of the requirements for a Gold Seal Flight Instructor Certificate, the ASI or AST should issue FAA Form 8060-4 with the appropriate flight instructor ratings. 1) Prepare the certificate in duplicate, per Volume 5, Chapter 1, Section 5. 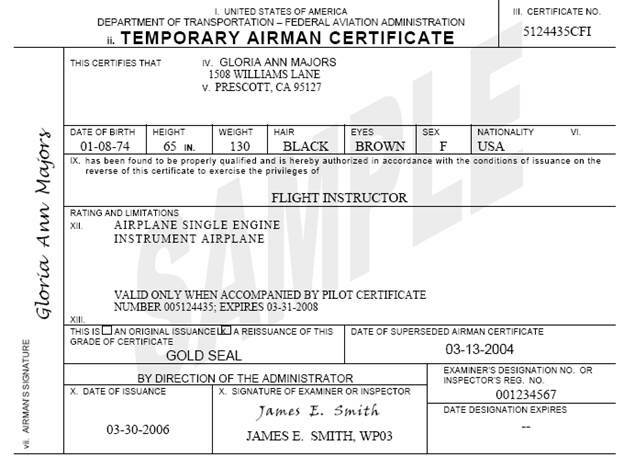 2) Enter the words “Gold Seal” as shown in Figure 5-61, Sample FAA Form 8060-4, Temporary Airman Certificate—Gold Seal Certificate. 3) Number the certificate with the same certificate number that appears on the applicant’s superseded Flight Instructor Certificate. 4) Complete the ASI/AST certification section. Sign the reverse side of FAA Form 8710-1. 5) Forward the completed file to AFS-760. H. Complete the PTRS Record. Complete the PTRS record in accordance with the PPM. • Denial of issuance of a Gold Seal Flight Instructor Certificate. NOTE: If the ASI or AST denies the applicant a Gold Seal Flight Instructor Certificate, record the action in the PTRS. • Renewal of Flight Instructor Certificate. • Reinstatement of Flight Instructor Certificate. • Added rating to Flight Instructor Certificate. RESERVED. Paragraphs 5-574 through 5-590.